Mix butter, 1/2 cup powdered sugar and the vanilla in large bowl. Stir in flour, nuts and salt until dough holds together. Shape dough into 1-inch balls. Place about 1 inch apart on ungreased cookie sheet. Bake 10 to 12 minutes or until set but not brown. Remove from cookie sheet. Cool slightly on wire rack. Roll warm cookies in powdered sugar; cool on wire rack. Roll in powdered sugar again. This is staple on any Puerto Rican table at Christmastime...and yeah yeah yeah I know..but Ketana you're not supposed to have any sweets..oh but my loves..I'd slap ya mommy stupid for some of this..and I ain't kidding.. Blend all ingredients together in a blender. Carefully pour into caramelized pan and bake at 350º in a "baño de Maria" (bain marie) for about 50 minutes or until golden. Test with a knife, it should come out clean. Remove from oven, cool and refrigerate at least 3 hours. Melt the butter gently in a saucepan. Turn off the heat and add the crushed digestive biscuits. Turn the mixture out into a 7 inch flan dish that has been lined with tin foil, dull side up. Spread the mixture out evenly and pat down firmly. Chill the biscuit base in the freezer for half an hour. Mix the cream with the Philadelphia cream cheese using an eletric whisk. Add sugar to taste (artifical or real). Remove biscuit base from the freezer and carefully remove the tin foil. Turn out the cream mixture into the biscuit base and gently smooth out. Place the cherry pie filling on top just before serving. sounds quite nice, is this like a Cheesecake? I'm just a bit confused by your digestive biscuits? Is that like graham crackers? Cause that's what we use here in the states as the pie crust..maybe if you post a picture of these digestive biscuits..sorry but it sounds like something you would eat if your tummy was upset. I just made a double loaf of this today and it tastes amazing! I've made this a holiday tradition now. Preheat oven to 350 degrees F (175 degrees C). Spray or grease one 9x5x3 inch loaf pan. Whisk together the flour, sugar, baking powder, salt and baking soda. Cut in butter until mixture is crumbly. Add egg, orange peel, and orange juice; stir to mix and fold in raisins and cranberries. Pour into loaf pan and bake for 70 minutes or until toothpick inserted comes out clean. Remove from pan; cool on wire rack. oh boy angel you're recipe sounds delicious and I think I'll try it myself! Here's another one that's quite the tasty treat! Preheat oven to 325° F. Grease and flour bundt cake pan. Sprinkle pecans on the bottom. Mix all other ingredients together for 2 minutes. Pour batter into pan. Bake for one hour. Invert on serving plate after it cools (10 min). Glaze: ¼ lb butter ¼ cup water 1 cup granulated sugar ½ cup rum Melt butter and stir in water and sugar. Boil 5 minutes stirring constantly. Stir in rum. When cooled drizzle and brush glaze evenly over the cake top. Decorate with maraschino cherries and whipped cream. Delicious! ¡Buen provecho . . . ! I have no idea Ketana what a Graham's cracker is. The brand of diegestive biscuits I use are made by a company called McVities and I'm told they are sold in America. Here's what I use and they are low in fat too, which is good. They are wholemeal biscuits btw. okay thanks DFG and here's what is our Graham Cracker! Sylvester Graham invented Graham Crackers in 1829. Graham was a Presbyterian minister and avid vegetarian, who promoted the use of unsifted and coarsely ground wheat flour for its high fiber content. The flour was nicknamed "graham flour" after Minister Graham, the main ingredient in Graham Crackers. These are ever so much better than just plain old french fries! I hope you can find green plaintains! 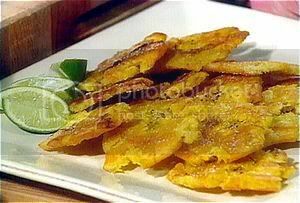 Making tostones is easy….. Slice the peeled plantains diagonally into 1" slices. Fry the slices over medium heat until they soften. Remove from oil and drain on paper towels. Using a tostonera (a press), slightly mash each piece to about half an inch in thickness. If a tostonera is not available insert the pieces between a folded piece of brown-paper sack and press down using a saucer. It is best to press all the pieces first before going on the next step. Dip each piece in warm salted water and fry again until crispy. Remove from the oil and drain on paper towels. Salt them. Tostones may be served with ketchup (kid's favorite) or with garlic sauce. Peel, boil, and cube the potatoes in salted water for 20 minutes. Drain and mash, adding butter, egg, corn meal, and ½ tsp. salt. Mix well and refrigerate until the potatoes are cold. Divide the potatoes into 10 portions. Sprinkle corn meal on one hand and carefully spread one of the potato portions on your hand flattening it in the middle. Take a tablespoon of prepared picadillo and place it in the middle carefully folding the sides over the meat until it is completely sealed. Sprinkle a bit more corn meal on the relleno to form a very thin coat. Fry over medium high heat until golden. Note: Sofrito is a mixture of olive oil in a saute pan and then some chopped onions, peppers, herbs, garlic and seasonings to taste. Put in your meat and let it cook together..it's delicious..questions? Let me know and I'll help you through it..
Now I have made these with leftover mashed potatoes and some corned beef hash and baked them instead of frying, they came out delicious! This is one of my favorite recipes! I finally managed to get my camera to upload my photos to my computer. Here's two photos of the cheese cake a I made on Christmas day. It might not look that tasty but it was. And it went in two shakes of a rattle snakes tail. this is without the cherry topping. DFG you don't bake it? Over here if you don't bake it it's a creme pie.. This cheesecake is a classic baked NY style cheesecake, but with one difference, with the right care it remains light rather than heavy and cloying like many NY Cheesecakes. Cheesecake is very simple to make, yet it can easily go terribly wrong, but by following a few simple rules you can master this delicious desert. I have left this recipe plain, but you can top the cheesecake with your chosen topping, fruit is always delicious and who doesn't like chocolate sauce? Grease an 8" spring-form pan. Place the pan on a large piece of heavy duty aluminium foil and fold it up the sides around the pan. In a mixing bowl combine the crust ingredients until evenly moistened (a fork works best). Firmly press the crumb mixture over the bottom and 1" up the sides of the pan using your fingers or the smooth bottom of a glass. Beat the cream cheese on low speed for one minute until smooth and lump free. Gradually add the sugar and beat until creamy 1-2 minutes only, scraping down the sides of the bowl and the beaters from time to time. Add the eggs, one at a time and continue to beat slowly until combined. Stir in the vanilla, lemon zest and the sour cream. The mixture should be well mixed but not over beaten. Pour the filling into the crust-lined pan and smooth the top with a spatula. Carefully set the cake pan in a larger roasting pan. Pour boiling water into the roasting pan until the water is about halfway up the sides of the cheesecake pan. Bake for 45 minutes. The cheesecake should still jiggle in the centre, it will firm up after chilling. Let cool in the pan for 30 minutes then loosely cover and refrigerate for at least 4 hours. Loosen the cheesecake from the sides if the pan by running a thing metal spatula around the inside edge,. Unmold and transfer to a cake plate. Ensure all ingredients are at room temperature before beginning. Do not over mix! Beat each addition until just smooth. Mixing incorporates air and you want as little air as possible incorporated into the batter. Bake the cheesecake in a water bath on the middle shelf of the oven. Do not use convection heat. Do not over bake or the cake will loose it's tenderness and become dry. For a clean cut, slice the cheesecake with a thin, non-serrated knife dipped in hot water, wiping it clean between each cut. Ketana wrote: DFG you don't bake it? Over here if you don't bake it it's a creme pie..
Well that might be an american thing saying if it's not bake it not cheesecake but it is over here. I did melt the butter that was then mixed with the smashed digestives. Your cheesecake looks yummy btw but I'm not keen on lemons. sage, black pepper, & garlic to taste. Boil chicken in stock with spices. Add veges & let simmer 10 minutes. Bring to rolling boil and add noodles. Cook an additional 10 minutes. Thicken broth with a flour/water mix to desired consistency. I add a hit of Cumin and some fresh parsley! LOL at the cheese cake chaster chessie! oh and I LOVE YOUR AVATAR!